The snow that we had over December, which has just about melted, wasn't very good for building snowmen. So here's a look back at what I did with better snow over the years. A classic little snowman complete with scarf and buttons. My friends and I came up with this snow-woman on a snow day in 2007. 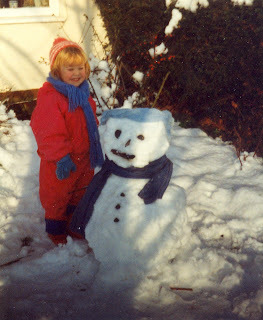 And the next year I made this sitting down snowman. Have any of you created less than traditional snowmen? How about an igloo? My friend commissioned me to paint this picture to be given as a Christmas present to her boyfriend's parents. It's their dog, Spud. I hope you all had a lovely Christmas, or other winter based celebration of course. The Christmas festivities (or Christmastivities as I like to call them) continue here so I made a necklace to add some Christmas to my outfit. It's made of mini-baubles!! So cute. I saw these paper stockings on Rock Scissor Paper and wanted to have a go myself. 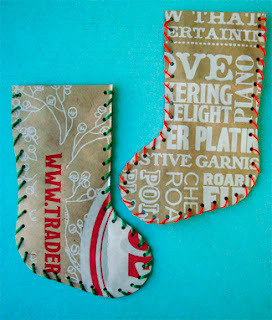 They used a Christmas Trader Joe's paper bag, but I happened to have one from Starbucks so I used that. 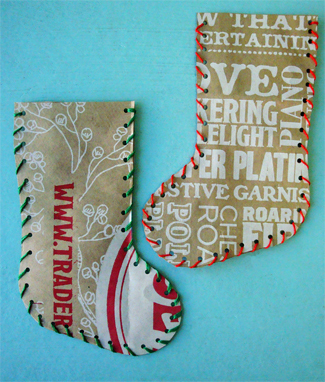 I drew a template and cut out six stockings from the paper bag and then six more from some thick card. I stuck the paper to the card and punched holes all the way around. Then I sewed green and red wool around the edges and strung all the stockings together to make a garland. I gave it to my friend who works at Starbucks, you know, the one I made this Starbucks cup for. She said she's going to put it up at work. Here's a peek at our Christmas decorations. Most people in my family have their own opinions on what to put up, so the key word is compromise. This year my sister bought a pack of mini candy canes (from Poundland. Winner), so we hung them over fireplace with mini pegs. As well as cute little ornaments on the fireplace I took a glass vase and filled it with pine cones that have fallen off our fake Christmas tree over the years and a few leftover red baubles. I also dug out some old photos and displayed them on red shiny thread with mini pegs that I covered in glitter. They show past Christmases including one from when my Dad was younger on the left, when my Mum was a child on the right, and my sisters and I in the middle. Did anyone else have bubble saxophones? On the shelves above the tv I put some of the random ornaments including two Santas and an angel my Mum received from one of her students. This guy usually lives in the porch but we've brought him inside whilst our doors get replaced. Here's the tree. It's red and gold themed as usual but we bought a new angel this year. She's a bit of a beast compared to the size of the tree, but we like it. The lights are also new. We've always had coloured lights but this year we got white LED lights which use less electricity. I'm using this to justify my long showers. 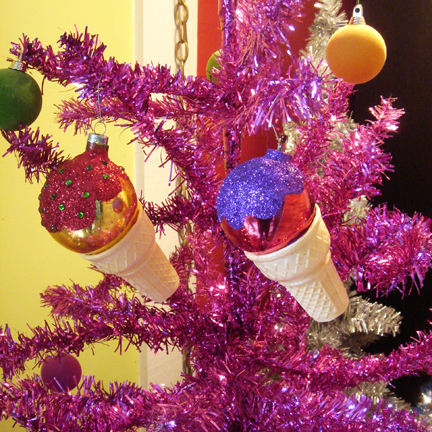 We also got some new tree decorations this year including sparkly gold instruments and mini red and gold mirror balls. What colour schemes do you go for with your decorations? My sister has a pink tinsel tree in her room with silver decoration which is pretty cool. 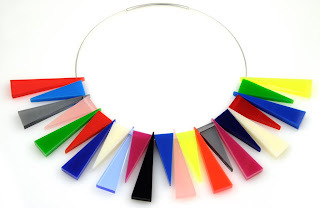 What do I do with plastic shapes that came out of a cracker? Make them into a necklace of course. I drilled a hole in the corner of each triangle and attached them to a chain with jump rings. Simples. It's a bit like this one from US Trendy Store, but muuuch cheaper. This set of 3 hand painted baubles was a commission for a friend of my Mum's. They depict three different views of Lake Tekapo in New Zealand. 3 for £10. Not bad at all. Isn't it annoying how bottle tops can't be recycled like the rest of the plastics? It just means we'll have to craft with them. Making a bottle top Christmas tree uses 6 green milk bottle tops. Cover the inside with PVA glue and fill them with whatever you have. The shinyer the better. I used buttons, gems, sequins, glitter, tinsel pipe cleaner. 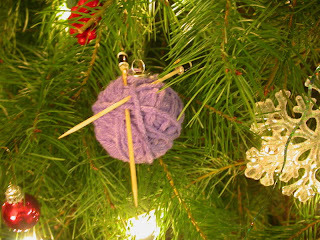 To make a Christmas card just stick the bottle tops on a folded piece of card and put a star at the top and something at the bottom for the base of the tree. Kids might also like making a Christmas tree decoration by sticking the bottle tops to a thick piece of card with a hole in the top to thread string through. I've been experimenting with negatives from photos developed years ago. I took photos of them using the macro setting on my camera - I did try just scanning them in but they came out fuzzy. Then I inverted the colours on the computer. Most picture programmes can do this. And it's like seeing a new photo. Then I played around with the transparency of negatives. I put some sequin stars behind this one before taking a photo of it,which came out white once I'd inverted the colours. With this one I put different coloured sweet wrappers behind the negative which created interesting textures. Interested in some less traditional Christmas baubles? Then check these out. This knitting needles and ball of wool bauble from craftster is so clever. And what's not to like about buttons in a bauble! From Polkadots are Love. There's quite a lot of snow and ice in my life right now so it's only fitting that my painting follows suite. I decided to paint this image of an icicle, taken in my back garden last year, as a challenge to see how detailed I could get it. Because there is a lot of detail in an icicle, that's for sure. I'm pretty pleased with how it turned out. I've been delving into my bargain box of jewellery and have refashioned a couple of pieces. The gold bow is actually a brooch, but I added some chain, beads and charms to make it into a necklace. The main component of this necklace started life as one third of a bracelet. I added chains to another part of the bracelet to make this necklace. December 1st means I can legitimately talk about Christmas! And I can go sledging! Ok, I did this yesterday, but it felt festive. Recognise anything on this magazine page? Top right, by the number 51? It's a pine cone fairy! 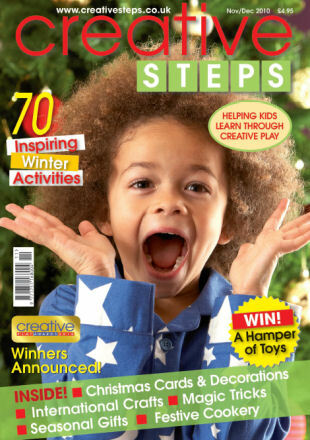 3 of my projects are featured in the current issue of Creative Steps magazine. ...and of course pine cone fairies. With more glitter than ever. It is the Christmas issue after all. Seeing my name in print is awesome.